1) Wayfinding – A wayfinding display is like asking your visitors, “May I help you,” but it doesn’t intrude and assume they need assistance. It can greet people with a clear layout of your common areas so they don’t have to ask for directions. 2) Make it Accessible – Place your digital signage at eye level and viewable from different angles so people can get close enough to scan QR codes and read the message comfortably. 3) Enhance Your Appearance – Your signage content is your brand’s face to the world. Make it visually appealing with a simple message, and use moving images and graphics to make it interesting. 4) Keep it Legible – Use an easy-to-read typeface. Bold-face sans-serif fonts such as Arial, Helvetica or Verdana will read easily at a glance if the font is large enough. Test your font size at the distance your signage is most likely to be read. A general rule is one inch of text height for every 10 feet. 5) Cut the Copy – Keep your message as concise as possible. The 3×5 Rule can be effective: limit the amount of text on your display to three lines, each with five words or less, or five lines of three words or less. 6) One Move at a Time – Animated content attracts attention, but having multiple videos running in different areas of the screen can confuse viewers and turn them away. 7) All the Right Places – In addition to areas with high foot traffic, place digital signage where people will be the most engaged. Wherever people sit, stand and wait every day can be an ideal spot and a good strategy to reduce perceived wait time. 8) Keep it Fresh – No matter how eye-catching your content looks, it will eventually go unnoticed out of familiarity. Consider the demographics and the time of day and change content accordingly. 9) Call Viewers to Action – If you want your viewers to do something, make sure your call to action is short and specific. Leave the CTA on the screen the whole time, or show it several times as the content rotates. 10) Make it Personal – Beacon technology can have individual displays interacting with customers that have your business’s app and Bluetooth enabled on their smartphone. 11) Small Package, Big Message – Don’t underestimate the power of small format displays. A discount code offer popping up on a touch screen as a customer walks by can lead to a quick sale. 12) Manage Content Remotely – Digital signage with remote management capability allows you to change content in real time and push it out to a single display, a group of displays or every display in your network, all from a centralized location. 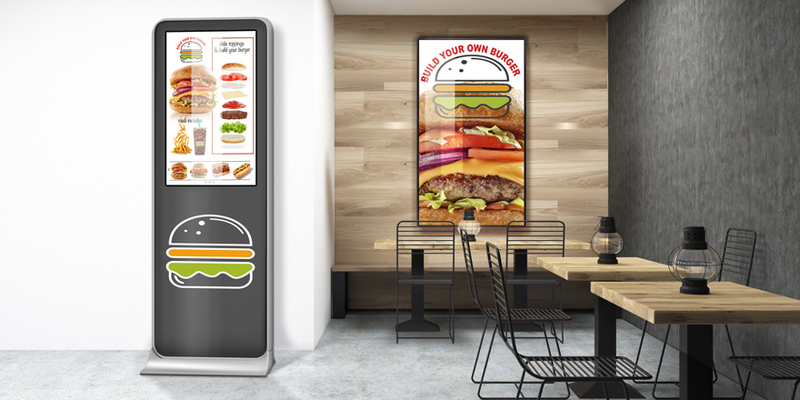 One of the main benefits of digital signage is that it is “alive,” allowing you to quickly change content and test new content without having to remove and replace printed materials. Experimenting can be fun and rewarding in terms of action taken, increased business and customer loyalty.